Will Congress’ cheap politics help it in surpassing BJP’s popularity? In a bid to bring down the BJP in the eye of the masses, instead of bringing themselves up, the Congress has been campaigning against almost all the senior leaders of the BJP. Recently, Congress shared a video of Uttar Pradesh Chief Minister Yogi Adityanath and tagged him as a ‘criminal’ who still has several cases pending against him. On the evening of January 14, Congress went a step ahead from UP’s CM to India’s PM. The Bharatiya Janata Party (BJP) which came to power after sweeping the 2014 Lok Sabha elections has constantly been criticised for one thing or the other. If sometimes they were accused of ‘saffornising’ the nation, on other occasions BJP was accused of tampering with the Electronic Voting Machines (EVM) but even after facing severe criticism, BJP never did ‘cheap politics’ which the Opposition seems to be resorting to these days. BJP’s prime face Prime Minister Narendra Modi has also been condemned over the schemes which he gifted the nation — from expanding the reach of Aadhaar scheme to the demonetisation of currency and to the implementation of the Goods and Services Tax. In a bid to bring down the image of the BJP in the eyes of the masses, instead of pulling up their socks bringing themselves up, the Congress has been campaigning against almost all the senior leaders of the BJP. Recently, Congress shared a video of Uttar Pradesh Chief Minister Yogi Adityanath and tagged him a ‘criminal’ who still has several cases pending against him. On the evening of January 14, Congress went a step ahead from UP’s CM to India’s PM. In the campaign (seemed to be laid out to bring down the ruling party) Congress mocked the way the Indian prime minister greets world leaders during visits. In the edited video, the Congress focused on the ‘awkward’ moments rather than focusing on what those visits yielded for India. Since PM Modi visited the United States to meet President Donald Trump, Congress and other opposition parties have been taking jibes on ‘hugs’ which PM Modi and President Trump shared. However, they failed to appreciate the measures taken by US post Modi’s visit against our notorious neighbour — Pakistan. 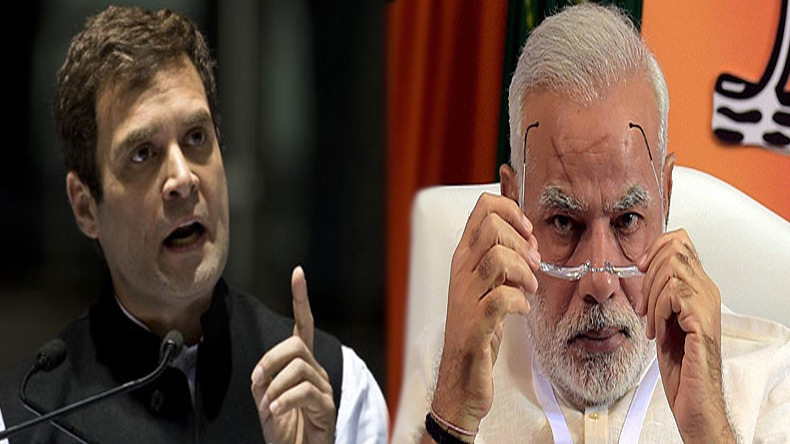 Congress which is slowly turning in to a party whose main agenda seems to be bringing BJP down rather than to take the nation ahead, failed to release a statement when their president criticised the nation along with its current political leaders in New York. What Congress fails to understand is, Indians don’t want an opposition party whose only job is to crib against every step taken by the ruling party but they are in need of a party that guides the nation in moving forward. Let’s talk about the famous ‘demonetisation drive’ where for months people queued outside the ATMs just to get their hard earned money. India had literally become ‘cash less’ and people suffered, with many even sleeping on an empty stomach. However, the people supporting the drive were always in large numbers as compared to the people criticising the drive. Soon after the drive, sacks filled with demonetised currency were found floating in rivers and sewers all across the nation, which clearly indicated that plenty of Indians had a huge amount of undisclosed incomes. But no matter what, this ‘political feud’ between the BJP and the Congress has also put laughter on many faces. Congress party which had been accusing the BJP of playing ‘religion politics’ was found visiting only temples before the 2017 Gujarat and Himachal Pradesh assembly elections. The opposition also attacked BJP’s Yogi Adityanath for his crackdown on illegal slaughterhouses in the state but what they failed to understand is that the alleged crackdown was only on the illegal slaughterhouses, which were not recognised or certified by the government. Reports suggested that a slaughterhouse in Aligarh was surpassing its slaughter limits by killing over 35,000 cows a day than just a few hundreds. BJP’s sole push is to bring the unorganised sector into an organised one. I may agree that the path chosen by the party might not be all efficient but at least it is working to make the nation developed rather than just vacationing abroad and releasing unworthy remarks and allegations. This piece is not about how BJP is pushing the nation forward or how Congress is trying to pull it back, but how the political parties should keep themselves away from indulging in ‘cheap’ politics.